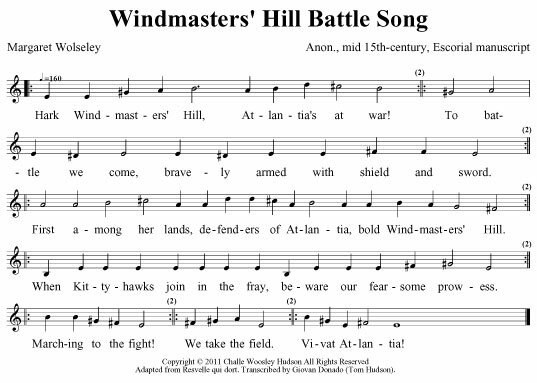 I composed the following song in spring 2011 to compete for the title of Windmasters' Hill Baronial Bard. Our Baronne, Guenièvre de Monmarché, asked each entrant to write a war song for our beloved barony. I began with a tune already meant for martial lyrics: Resvelle qui dort from the mid-15th century Escorial manuscript. I imagined this as a call and response song for the people of the barony to sing as they marched from our encampment at Pennsic to the field. Each line should be repeated. Hark Windmasters' Hill, Atlantia's at war! To battle we come, bravely armed with shield and sword. First among her lands, defenders of Atlantia, bold Windmasters' Hill. When Kittyhawks join in the fray, beware our fearsome prowess.